he's been v. busy and spreading himself too thin lately. Ding ding ding. 10 points to Ben for an excellent pun. 2 for 26 against the Lankys - that's reasonably tasty? Acquired taste is marmite...as is Sidebottom. NWG seems to have acquired it. Actually, it looks more like Jesus. I spotted Sidebottom myself last night at Old Trafford - he has clearly now escaped from the Marmite, although his hands may still have been a bit greasy given some of the wides he was bowling. Is that your hand, NWG? D- NWG thinks it's Ryan's wife's hand as she shockingly discovers her husband has been turned to marmite. AP - you must have been mistaken. Ryan is still trapped, and NWG is a bit glad. Of course, I didn't expect NWG to look after her nails so poorly. BBC1 7.30, Lover boy Ryan is on Question of Sport. ...and you know this because? I bet you pressed the REC button....or will at least watch it. Anonymous - they are all pre-recorded. 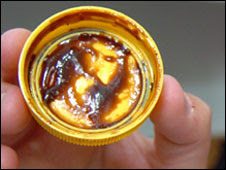 If you type in to google "ryan, marmite, lost" it will prove to all that he is, indeed, trapped. NWG is not in the business of making things up. Not in the business of making up things? You are all made up NWG. You are not real. You don't even have a name. Well your a woman so it shouldn't hurt....unless you're trying to tell us something NWG? Oh anonymous, how NWG has had to go over and over again about her gender. NWG is a girl. This must stop. And if in doubt, take a look at her picture with Matthew Hoggard. The operations are pretty good these days. My friend Stani is an expert. He actually performed the one on Albertus Morkel to turn him into Albie Morkel, a woman. Photos mean nothing. It's names that are the proof. NWG will only reveal her first name if England win the Ashes, though she can assure anyone who's interested, that she does have a real name and that there are people who know it. I give up. This is worse than water boarding. I'm gone. If you want me back you know where to reach me.